Now it did occur to me that people might find this to be somewhat mean, but I gave it some thought and, in all seriousness, I hope when I get to that age that people do the same with me. I want younger people to crack jokes relating to whatever is currently pop culture, playing music* for my ambling along. Why? Because it'll mean that I'll have made it to that age against all odds. Depending on the society, I would love to baffle them as to how I survived Logan's Run for so long. And you better believe that I'll be a crotchety sarcastic old coot. I wait for the day when my insane ramblings will go unnoticed (they largely do now, but I often get eyes rolled in annoyance). I look forward to yelling at random children to get off the grass -especially if they're on pavement at the time. I also can't wait to get one of those hats all old men seem to have. I honestly don't know where they get them. I've looked and I've found many close imitations but they're never quite right. It must be one of those things as you get older, a secret society of old men's hats sellers reveal themselves to you. One day I will own 6 of them. One for every day of the week except Sunday, when I'll attend church spiffed up as best I can muster, including what I hope is the world's worst comb over. 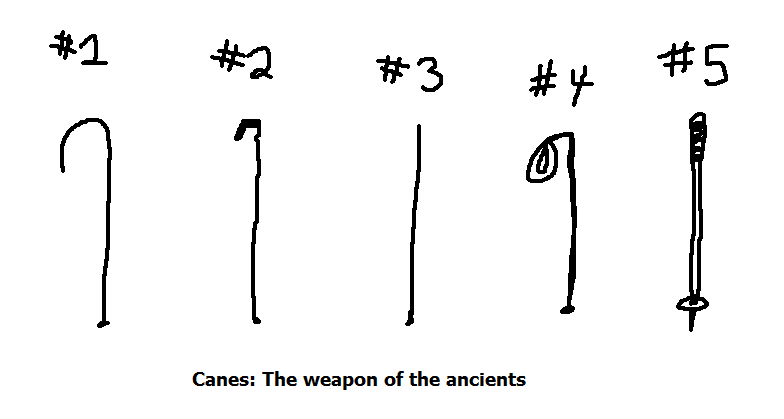 Ok, I'll grant you that number five is a ski pole and not a traditional cane, but I see potential in it. Personally I'm leaning towards number 2. Light, but with a good strong head. Perfect for bruising those who might be cruising on my turf. So I say to any old person who might share company with me at some point, you can expect that in my presence I will be playing scratchy old tunes in my head and cracking silent jokes about how unhip you are, but I fully expect you to enjoy it. I'll look for the cane and to be pelted by hard candy as you recite an endless stream of nostalgia. And I'll look forward to one day sharing a similar relationship with your great grandchildren. *As I wrote this, whatever was on TV started playing Glen Miller. I assume that's a sign of how right I am. 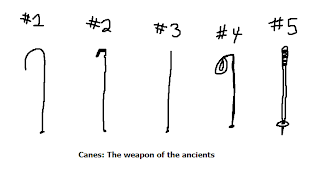 I'd use number 5, you can conk on thier heads and spear them. You just lost all 12 of your senior citizen readers and in 40 years, I'll be pretty upset about this post too. But seriously, the Entertainer is the best song ever and canes are amazing. I might start using one just because. Old people are, well old. The canes are cool, but you might want one with silver studs on it--or one that is actually a gun or has a hidden stiletto knife in the handle--just sayin'. When I get old, I'm gonna be a motorcycle riding Granny, my long silver hair and old Granny bosom flying out behind me in the wind. As for a cane, I'm going to have a sword in mine. I'm with you on the hats. The only good one I've ever found was my grandfather's and it's too big for me. By the way, my cane's going to have a laser at its tip. Now if you don't mind, I have to go loiter on some old guy's lawn in the hopes he'll drop is hat during the irate yelling and fist shaking portion of his day. A deadly laser or laser pointer? Either way is cool. I've been beaten by 4 and 5.
go on with your bad ol', crotchety self! Can I call you a curmudgeon? Oh, I've got a self-portrait - complete with cane on my blog today. I love old people too. There is something so alluring about the mix of the aroma of Bengay, the just from the barber haircut, cardigan sweaters and the perfectly creased fedora. Hmm, maybe it is just old men that I like? Old women tend to smell like cold cream, whine a lot, and so darn short. Seriously, every time I go to an old folk's home, I feel like a player for the WNBA. and don't they have straps? You would never lose it! Did I mention that I love old people? Great post! I set the entertainer playing and read the post while listening to that and now I kind of want to write a post to a theme song. Also, you'd make a great sarcastic old man. You can act crazy, and people will have to accept it, but really you'll just be laughing away on the inside. And then possibly pooping yourself. I'm trying to get that figured out. Not sure why it's deleting your comments. those poor kids who accidently throw their ball in your yard. Instead of giving them the ball, they'll get a ski pole in the head! Eat your prunes!